The Rev. Amy Kulesza DeBeck has been minister since August 2008. Amy brings a spirit to the shared ministry of UUFE that revolves around beloved community. 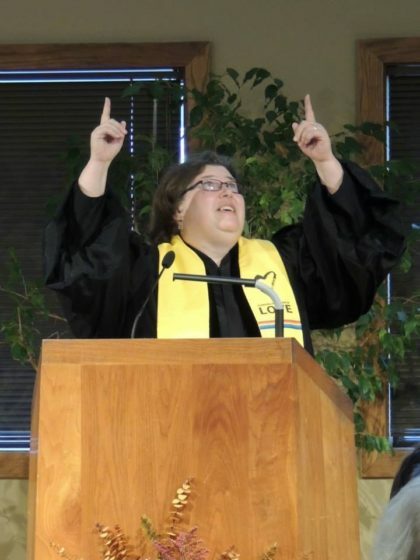 Following in the footsteps of minister emeritus Gordon Gibson, Amy also enjoys a public ministry in Michiana, participating in Indiana Moral Mondays, the NAACP, Elkhart Area Ministerial Association, Church Community Services, Downtown Clergy Coalition, and meeting with UU colleagues from across the MidAmerica Region. Seeking equality for people who are LGBT (lesbian, gay, bisexual, and transgendered) is of special interest to Amy and she is active with Equality Indiana and the Michiana Resource Center, as well as a group dealing with oppression beyond the LGBT community, Standing on the Side of Love. Amy came to Elkhart from the UU Church of Loudoun, where she served for three years. In Virginia, she did summer ministry and internships at UU churches in Reston, Sterling, and Fairfax. While Amy is from the DC Metro area originally, her ministerial formation (and the formation of her family, too!) happened in central Maine, centered around Bangor Theological Seminary. Amy is married to Kevin DeBeck, and they have two children: Henry, born in 2000, and Eliza, born in 2003.